Last month during all of the awesome pre-Christmas giveaways circulating around social media, I was lucky enough to win a pair of Signature Spurs on Horse Collaborative. At first I was kinda like “cool… I don’t really need more spurs but they look nice and they’re free!”, but now that I have them and realize just how nice they are, I’m pretty stoked. 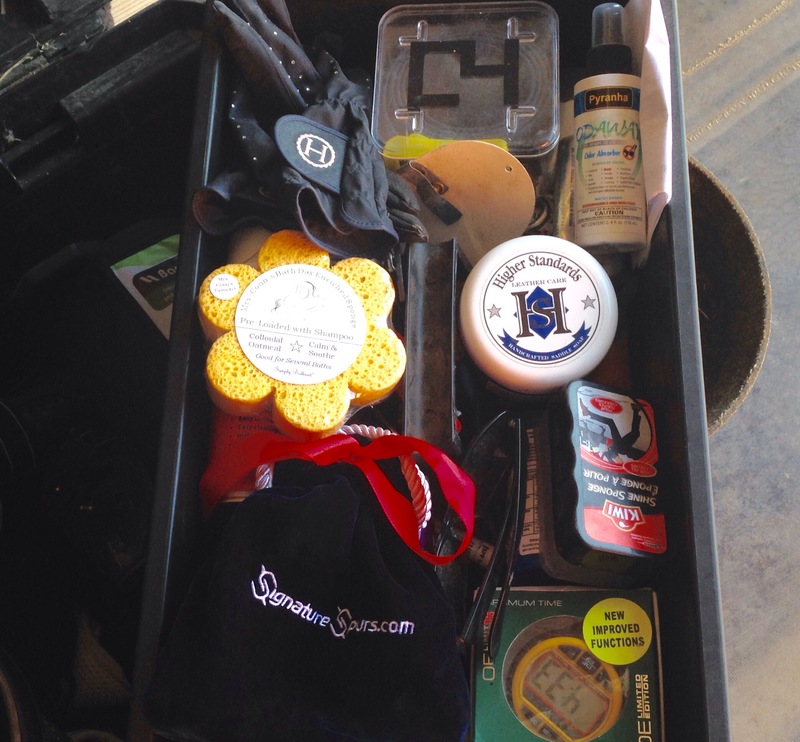 For those of you who are unfamiliar with Signature Spurs, they make and sell several personalized items including stirrups, halters and nameplates, spurs, and custom whips. When I won the spurs I was very happy to find that they have tons of options to choose from, since Princess Henry will only tolerate a very small roller ball spur. You can have anything you want engraved on them and choose from three fonts (I went with my full name in Script). 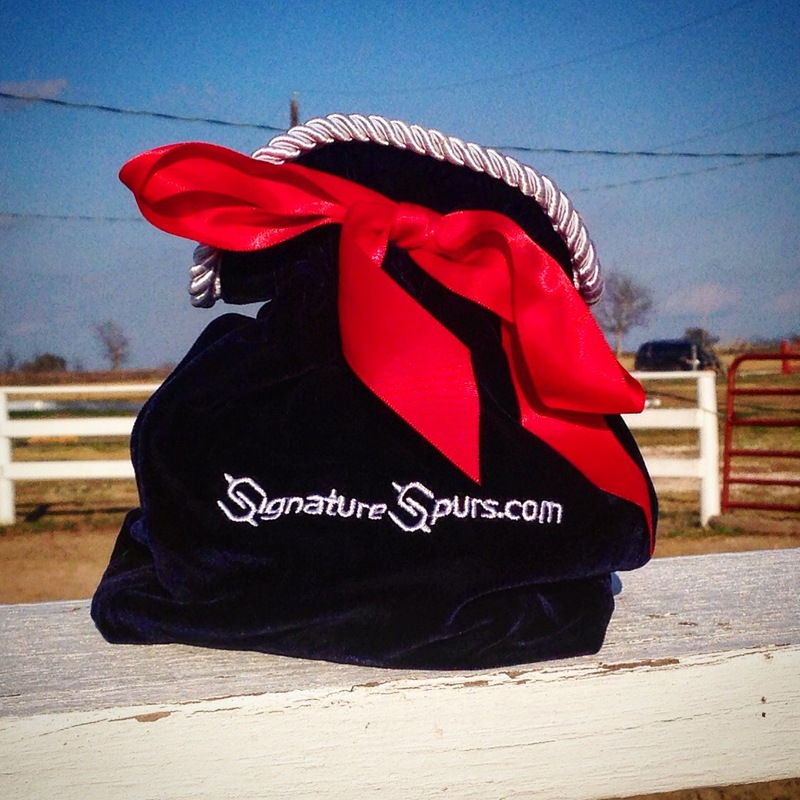 The spurs by themselves are $59.95, or you can get the full package option that includes spur straps and a gorgeous embroidered velvet pouch for storage. Considering that similar spurs from Stubben or Herm Sprenger are $45-80 and these are very similar quality, the price seems fair. They arrived in a nice gift box, inside their little velvet pouch. The presentation of these is very high class (hint: GREAT GIFT IDEA) and well done. The spurs are high quality stainless steel and engraving is expertly executed. It’s subtle enough to pass muster with even the most conservative hunter or equitation rider, and overall just a really classy way to personalize your spurs or permanently mark them so they don’t magically grow legs and disappear. I am also really glad that mine came with the spur straps, because although this might sound odd, they are the nicest spur straps I’ve ever come across. The leather is very high quality, soft, and supple. Take the option that comes with the straps and storage bag – it’s worth it. These beauties will live in their velvet pouch in my tack trunk and be reserved for horse shows or other special occasions where my “everyday” spurs with their rubber straps might not be so glamorous. I love the fact that if I ever accidently leave them behind somewhere, there’s no doubt who they belong to. Hopefully this means we’ll have a long and happy relationship. Those are lovely! I want some now! I saw those on your insta and wanted them. Not sure I’m a $90 spur type of girl though. Very pretty either way! I’ve been drooling over these and have been wondering about the price point! Thank you for the helpful review!! I would want to wear them all the time because they are beautiful! Those do look nice, and I love those crops.